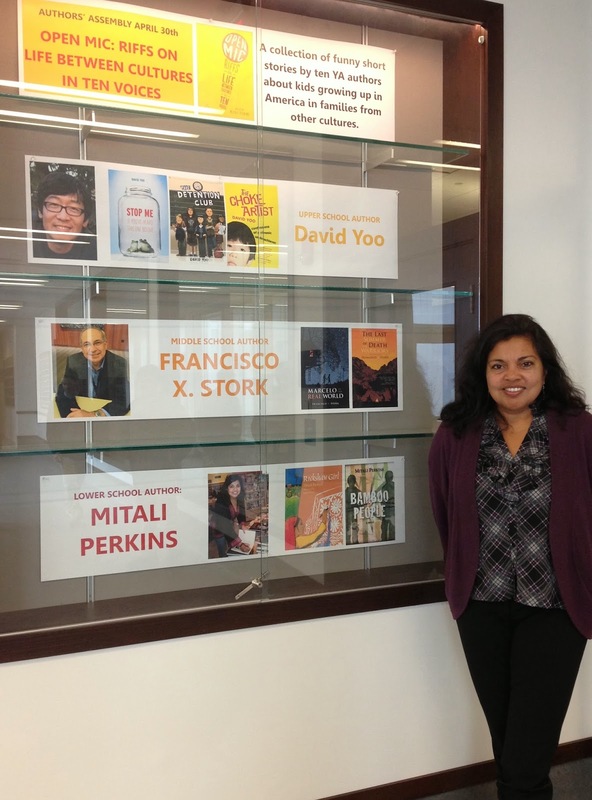 AuthorMitaliPerkins: Hats Off to a Legion of Librarians in Boston and Brooklyn! Hats Off to a Legion of Librarians in Boston and Brooklyn! I had a marvelous ten days visiting schools in the Boston area and in Brooklyn, as well as teaching a few workshops at the annual New England Society of Children's Book Writers and Illustrators conference and the Muse and the Marketplace 2014 conference sponsored by Grub Street. 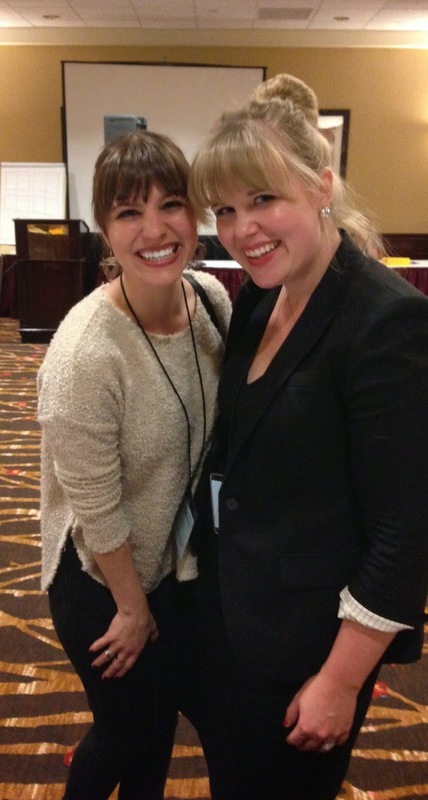 In case you missed my whirlwind trip via social media, I've gathered a few photo highlights. As you can see below, it took a bundle of librarians to make this trip happen. I returned from my journey even more impressed by these talented cheerleaders of kids and reading. They are truly an American treasure. I started and ended the trip by presenting with authors David Yoo and Francisco Stork, who both contributed to OPEN MIC. 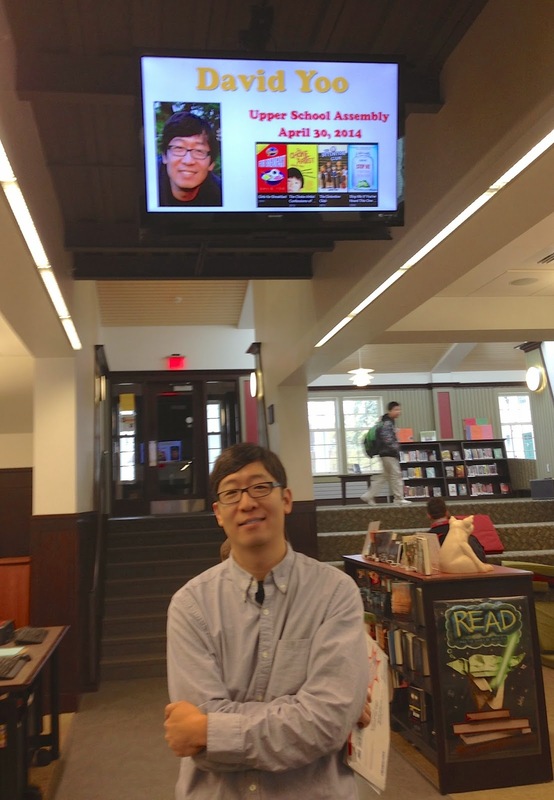 David (pictured above) met with middle schoolers at the Fenn School in Concord, Massachusetts. Meanwhile, Francisco shared with high schoolers and I spoke to upper elementary students. These days, school librarians must be book experts, tech geniuses, and marketers extraordinaire, like Susan Fisher of the Fenn School. Chatting with students after my talks is always a joy, especially when school librarians have prepared the kids well for my visit. Students at the Fenn School gathered to chat about the differences between books and movies as story venues and to ask questions about BAMBOO PEOPLE. Next I headed to Nashoba Brooks Academy to meet with school librarian / diversity champion Sam Kane, who coordinated my presentation to second graders about RICKSHAW GIRL. 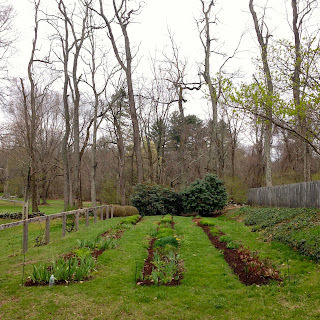 I had a bit of time so I stopped by the Old Manse in Concord, where Thoreau planted this garden at the Old Manse as a wedding present for the Hawthornes. It's doing fine. 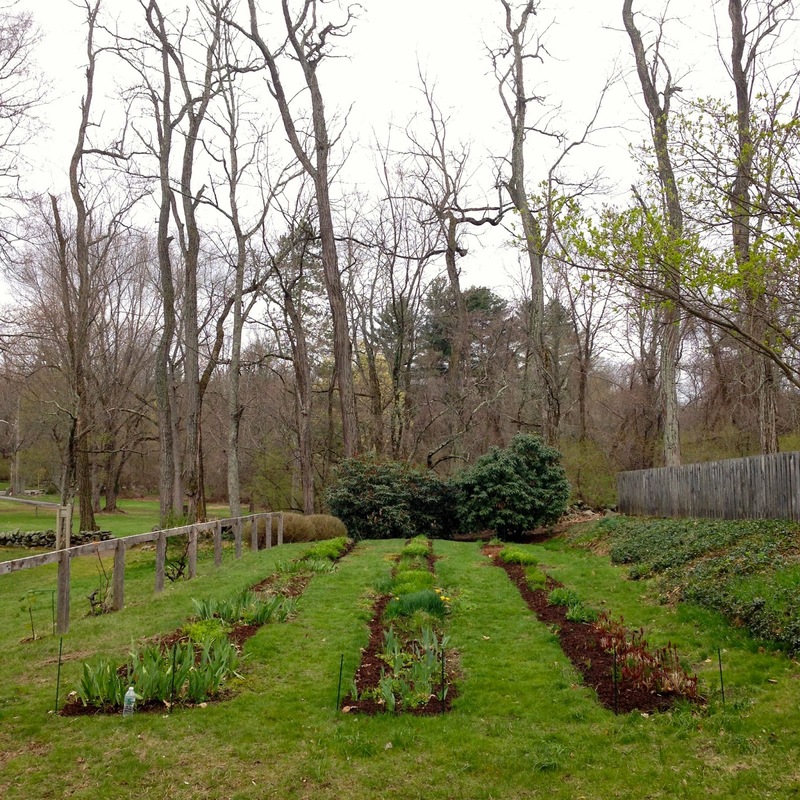 My creative spirit stirred on a raw spring day as I walked the grounds where famous writers used to dwell. But there's little time for writing during an author visit maelstrom. The day after my sessions at the Fenn School and Nashoba Brooks Academy, I visited Zervas and Underwood schools in Newton, Massachusetts, where I was hosted by parents serving on Creative Arts and Sciences committees. Next stop, Springfield Massachusetts for the New England Society of Children's Book Writers and Illustrators conference, where I taught workshops on dialogue and virtual book launches. I enjoyed this reflection of the Campanile from my hotel room. Seeing writing buddies galore (Lisa Papademetriou and Ammi-Joan Paquette are pictured above) is one of the best reasons to go to this marvelous conference. 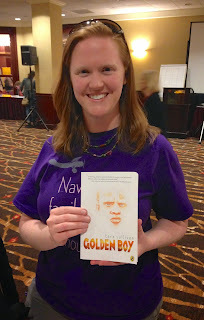 Tara Sullivan shows off the forthcoming paperback issue of GOLDEN BOY, her award-winning novel about Habo, a Tanzanian boy with albinism. After a quick session on crafting place in fiction at the Muse and the Marketplace conference in Boston, I headed to Brooklyn for an assembly at Packer Collegiate School, where Lois Lowry studied as a girl. The grounds and building reeked of tradition, and the auditorium looked like an old chapel. 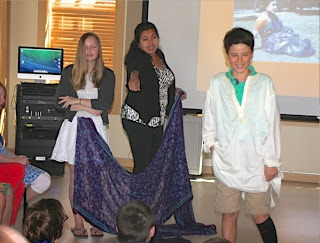 The students were receptive and engaged, thanks mostly to school librarian Kristyn Dorfman, who welcomed and hosted me. Next I taught kids at P.S. 230 in Brooklyn how to draw alpanas. 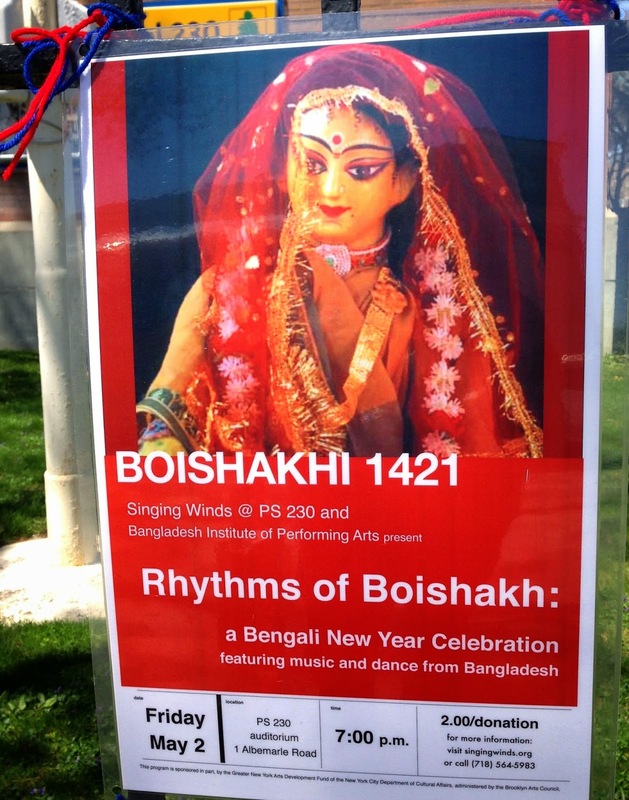 Since many of them are Bangladeshi, they're naturals, and the art was amazing. Thanks for this visit goes to Susan Brill, a superb teacher who cares deeply about reading global books in her multicultural classroom. I knew RICKSHAW GIRL was a "mirror" book for the kids of P.S. 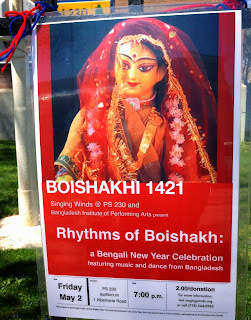 230 when I saw this poster on the gate. That afternoon I strolled across the Brooklyn Bridge and back. Stopped to watch handball on one of the playgrounds and was tempted to get in line for a game. Next stop was Brooklyn Friends School, where I led writing workshops for 8th graders and presented a session for the 5th grade. 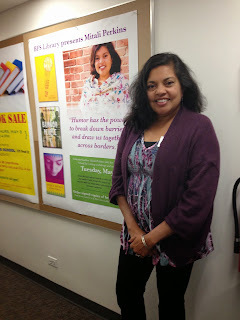 Middle School Librarian Angie Ungaro took excellent care of me at Brooklyn Friends. Again, note the superb signage. Back in the Boston area, I visited Derby Academy in Hingham, established in 1784. Tuition used to be an armful of firewood. I think it might be a bit steeper now. Librarian Barbara Zinkovich arranged my visit impeccably. I've gotten good at multitasking during presentations. Here I'm teaching one kid to bargain for bananas in an imaginary Bangladeshi marketplace while I wrap a saree around a second volunteer. Reading Librarian Andrea Fiorillo, David Yoo, Francisco Stork, and a lovely bookseller from Andover Bookstore after our Big Read panel on growing up between cultures.